Create an Emergency Supply Kit – Create your own emergency supply kit. Consider storing these items in a waterproof container: First aid kit, flashlights, blankets, clothing, shoes, water, non-perishable food, radio, prescriptions, toiletries, insect repellant, extra keys, important documents like insurance policies, emergency phone numbers and some cash. Include a phone charger that plugs into the car’s power system for at least one of your cell phones. If you have children, include toys to keep them occupied and of course, bring the usual diaper bag contents for infants. Don’t forget leashes and carriers for the pets. Prepare you Auto – Keep your car maintained and the tank full of gas. Know ahead of time the safest route to an emergency shelter and keep in mind alternate routes in case yours becomes blocked. Safety – Safety features in your house should include smoke alarms, fire extinguishers, and carbon monoxide detectors. Consider learning first aid, including CPR. Know when and how to turn off your utilities. Review with your children how to call 911 and other emergency numbers. Have a Plan – Everyone may not be at home when the storm hits, so designate a meeting place and review it with all family members. Also, designate a friend or relative that lives away from the storm’s path, as an emergency contact. Write down all the contact information for each family member to carry with them. Practice your plan so that everyone can remain calm and competent when the storm actually hits. Keep Informed – Register for emergency alerts for your cell phone, tablet or computer. Bad weather can take out phone lines and cell towers so be sure to keep a battery-powered radio tuned to the appropriate channel/station. Know the difference between a Hurricane Watch and a Hurricane Warning. 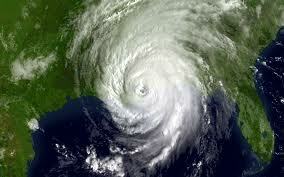 A watch means a hurricane could happen, while a warning means that it will happen. This is when all of your preparation and practice will go into effect. With these helpful tips and a little planning you and your family will be better prepared should a hurricane make landfall in your area. Perfect for large or growing families, this Southern style, two-story house plan delivers plenty of style and comfortable living. Two covered, full-length porches (one on top of the other) give this home striking curb appeal reminiscent of the plantation homes of yesteryear. 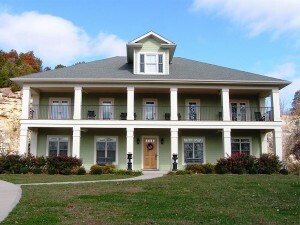 Sturdy columns and an upper level porch railing add touches of characteristic elegance that cannot be matched. Upon entering, the foyer greets guests and directs traffic to the generously-sized family room just right for conversation and activities with the kids. At the back of the home, the island kitchen and breakfast nook join forces making it easy to serve snacks and quick meals on the go. Additionally, this arrangement is convenient for supervising the kids as they work on homework assignments while dinner is prepared. Don’t miss the walk-in pantry, snack bar and butler’s pantry. For special occasions and holiday meals, the formal dining room is sure to accommodate a crowd. On pleasant days, you’ll enjoy spending time in the backyard or on the patio. A half bath, storage closets and the 3-car, side-entry garage complete the left side of the home. There is plenty of room for everyone upstairs where three bedrooms deliver comfort and rest at the end of the day. Your master bedroom is outfitted with a large walk-in closet and deluxe bath. It also enjoys double door access to the deck. Pay attention to the pocket door connecting your master bedroom to the peaceful study. This space works well as a home office and is conveniently located for those who like to pay bills online or read quietly before bed. Bedrooms 2 and 3 share a compartmented bath, and each enjoys its own private vanity and dressing area. The bonus room reveals a wet bar and makes a nice TV room for the kids. Notice the thoughtful positioning of the laundry room saving steps on wash day. A turned staircase leads to the third level where Bedroom 4 delights in privacy. Outfitted with its own bath and a walk-in closet, this space is perfect for your teenager or it could be reserved for guests. If you’re looking for comfortable family living that’s brimming with charm and comfort, this Southern home plan can’t be missed! If you’d like to learn more about this featured house plan, click here to view floor plans and additional details.